Product #22021 | SKU NE8MC-B-1 | 0.0 (no ratings yet) Thanks for your rating! The Neutrik NE8MC-B-1 etherCON Cable Connector Carrier features a black chromium shell, fixing disk, chuck, and boot. 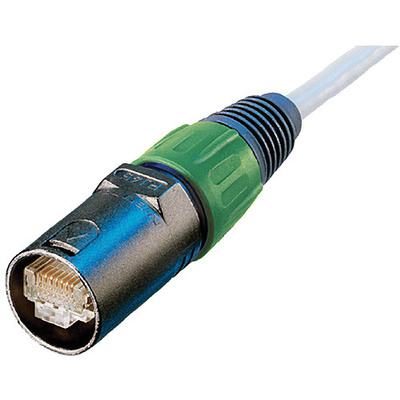 The boot (same as that in X-Series) is suitable for cable diameters ranging from 0.13 to 0.31” (3.5 to 8mm). It is for non-preassembled cables only. The etherCON cable connector carrier upgrades a conventional RJ45 connector to a highly robust lockable solution. Note: Cable connector carrier does not include an RJ45 plug.